For the Philippine TV series, see Ilustrado (TV series). For the followers of Ilustración, see Enlightenment in Spain. The Ilustrados (Spanish: [ilusˈtɾaðos], "erudite", "learned" or "enlightened ones") constituted the Filipino educated class during the Spanish colonial period in the late 19th century. Elsewhere in New Spain (of which the Philippines were part), the term gente de razón carried a similar meaning. They were the middle class who were educated in Spanish and exposed to Spanish liberal and European nationalist ideals. The Ilustrado class was composed of native-born intellectuals and cut across ethnolinguistic and racial lines—Indios, Insulares, and mestizos, among others—and sought reform through "a more equitable arrangement of both political and economic power" under Spanish tutelage. Stanley Karnow, in his In Our Image: America's Empire in the Philippines, referred to the Ilustrados as the “rich Intelligentsia” because many were the children of wealthy landowners. They were key figures in the development of Filipino nationalism. 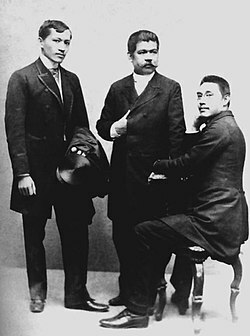 Three prominent Ilustrados in Spain: José Rizal, Marcelo H. del Pilar and Mariano Ponce (from left to right). Photo was taken in Spain in 1890. The most prominent Ilustrados were Graciano López Jaena, Marcelo H. del Pilar, Mariano Ponce, Antonio Luna and José Rizal, the Philippine national hero. Rizal’s novels Noli Me Tangere ("Touch Me Not") and El filibusterismo ("The Subversive") “exposed to the world the injustices imposed on Filipinos under the Spanish colonial regime”. However, in 1872, nationalist sentiment grew strongest, when three Filipino priests, José Burgos, Mariano Gómez and friar Jacinto Zamora, who had been charged with leading a military mutiny at an arsenal in Cavite, near Manila, were executed by the Spanish authorities. The event and "other repressive acts outraitings and activities, Rizal was executed on December 30, 1896. His execution propelled the Ilustrados . This also prompted unity among the Ilustrados and Andrés Bonifacio’s radical Katipunan. Philippine policies by the United States reinforced the dominant position of the Ilustrados within Filipino society. Friar estates were sold to the Ilustrados and most government positions were offered to them. ^ RAE - ASALE. "Diccionario de la lengua española - Edición del Tricentenario". Diccionario de la lengua española. ^ Thomas, Megan Christine (2012). Orientalists, Propagandists, and Ilustrados: Filipino Scholarship and the End of Spanish Colonialism. U of Minnesota Press. p. 213. ISBN 978-0-8166-7190-8. ^ Cullinane, Michael (1989). Ilustrado Politics: Filipino Elite Responses to American Rule, 1898-1908. Ateneo University Press. ISBN 978-971-550-439-3. This page was last edited on 20 September 2018, at 19:07 (UTC).